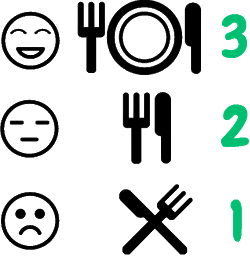 In the search bar on the top right of the Vanbrosia website (above the Rating Scale picture), you can search for restaurant names, keywords of dishes you like, eg. 'New York Steak'. The catch though, is that currently, the search function defaults to sorting the search results by 'Relevance'. To sort by date, please click on the link above the search results that says 'Sort by date'. When you receive your results, select the post you want and to go straight to the key word instead of scrolling through the post, hold down Ctrl and 'F' to bring up the browser window search. Repeat the keyword(s) you just put in, so 'New York Steak' following the example, and hit enter. This will bring up all mention of the keyword(s) on the page that you are on. Make sure that the number is in double quotation marks. So type in "3" exactly as shown, into the search bar. Put in a keyword that you are looking for, eg. name of a restaurant, location, cuisine, etc. Type in "3" Mosaic to see if I have ever had any 3's at Mosaic (FYI I have). As I have eaten at Mosaic quite a number of times, all the posts with 3's will show up. As mentioned above, sort the results by date to get the most recent posts. Click on the post title you want to see to bring up the entire post and see which dishes earned a 3. Note: In some cases, your search might still generate a result even though no 3's were eaten, because of the date (eg. August 3, 2012), description of the dish (eg. 3 eggs), etc. Apologies for this. Find the dud, in which case please use the back button on your browser to try another post. To view the pictures in magazine format, just click on any one picture in a post. Now you can 'flip' forwards and backwards, the post pictures. This is especially helpful when trying to read the menus. To find more dishes of the same category, click on the label tags at the bottom of each post. eg. after reading the entry on Rocket, you might want to see more 'sandwich' posts. Click on the 'sandwich' label tag link at the bottom of the post for more search results.